Pre heat oven to 210 degrees Fan Forced. Peel potatoes and slice into rounds approx. 1cm thick. Place into a large colander and rinse well under cold water. Lay in a single layer on a clean tea towel. Place a second tea towel on top and press gently to dry. Leave for approx. 5 mins to dry well. When potatoes are dry toss in a large mixing bowl with cornflour, olive oil and salt. Lay on a large baking tray, lined with baking paper, in a single layer ensuring there is space between each slice. Bake for 25-30 mins or until golden brown and crispy. To make aioli combine all ingredients in a small bowl. 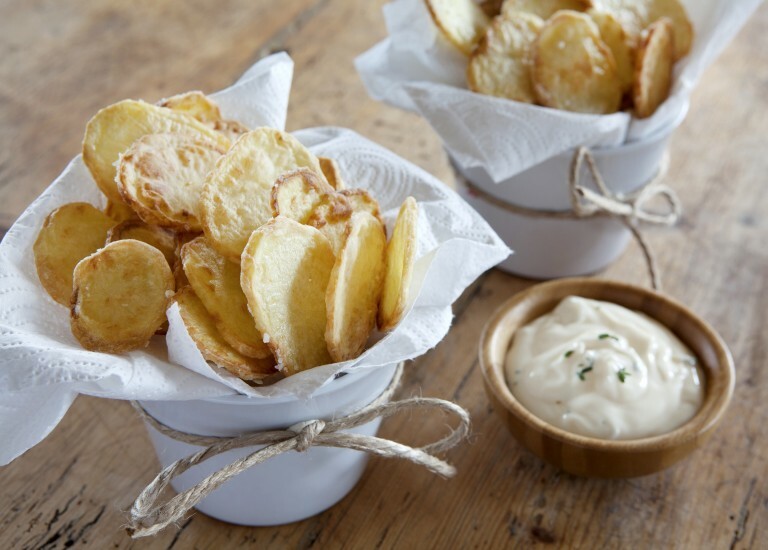 Serve chips immediately with aioli if desired. Kitchen Notes: Recipe can be doubled and cooked on two separate baking trays if desired. Address: 63 Nar Nar Goon Rd.